Throughout history civilizations have been born and lost countless times. In modern times through our accumulation of knowledge we have tried to piece together a timeline of the rise and fall of civilizations. However, through new discoveries and the hard work of many researchers, anthropologists and archaeologists such as Graham Hancock more previously unknown civilizations are being looked at in a new light. One of these civilizations that has been gathering attention recently is the Yonaguni Monument on Okinawa Island in Japan’s southern islands, dubbed Japan’s Atlantis. A City From The Past? 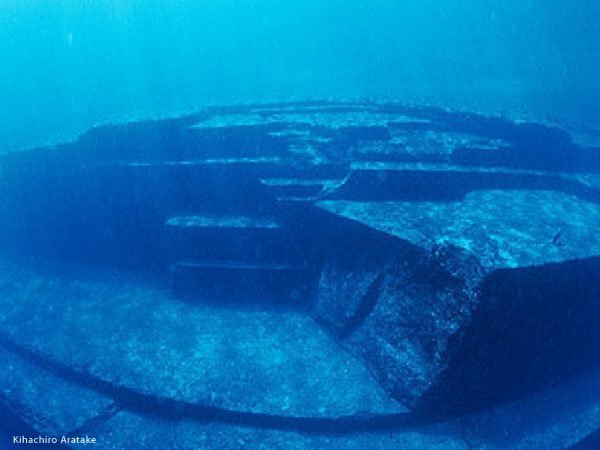 Amid controversy the Yonaguni monument is a submerged rock formation that is thought to be the remnants of a 10,000 year old Japanese civilization. It was discovered by Dive Tour operator Kihachiro Aratake in 1985. Masaaki Kimura a marine geologist at the university of RyuKyus in Japan has spent fifteen years diving amid the Yonaguni anomaly. Kimura over these years has come to the conclusion that this monument is most definitely human made. According to Kimura, “The largest structure (Yonaguni monument) looks like a complicated, monolithic, stepped pyramid that rises from a depth of 25 meters [82 feet]”. The structure itself looks a lot like a ziggurat, a type of structure found throughout the world in Latin American pyramids and Middle Eastern cities such as Ur. However this construction is not alone. Alongside the monument ten other structures have been found on Yonaguni, including a castle, five temple-like structures, and what seems to be a huge stadium. What is more interesting is that all of these structures are connected by roads and water lines. The Yonaguni monument itself has had the most research undertaken upon it. The monument is made of sandstone, and is derived from the same singular rock formation, a staggering rectangle 150m by 40m and reaching 27m in height. On the peak of the monument a figure thought to be a Turtle has been worked into the stone, with straight edges and incredibly precise corners. Nearby are what seem to be stairs, cut into the sandstone. But how could this structure be created by humans if it is underwater? A marine geologist by the name of Robert M. Schoch accompanied Kimura and Hancock on a dive in 1997 and to the bewilderment of the rest of the crew deduced that the monument was just a natural formation. Schoch believes that the whole monument would have been created by wave erosion over millions of years, and even claimed that the precisely cut corners and stairwells were all produced by random wave erosion. While Schoch had previously been open minded in regard to structures such as the Sphinx being 10,000 years old, he was not convinced at Yonaguni. This seems to be another case of mainstream science refusing to identify anomalies that do not fit into their crafted version of human history. In response to Schoch, Kimura identified several different areas on the monument where it is clear that humans have depicted drawings of animals, disproving the theory that the monument is just a natural formation. READ Yonaguni Pyramid: Nature, Aliens or Lost Civilization? Could Yonaguni Be A Forewarning Of Our Current Fate? However there still seems to be a huge problem with the Yonaguni monument. How was it built if its underwater, and by whom? Kimura claims that Yonaguni was built over 10,000 years ago, when sea levels where much lower than they are now. 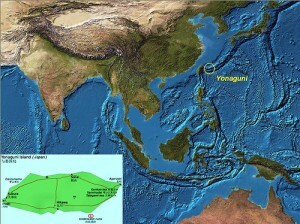 During this time, Yonaguni Island would have connected to main land Taiwan, possibly an important trade route for their civilization. In the recent decades, findings have found many settlements on the seabed along this land bridge. Interestingly, this fits into the picture, as it is becoming more and more accepted that there was some sort of advanced ancient civilization living around that period. Kimura, backed by Hancock, also believe that it was built by an advanced civilization that may be linked to the lost continent of Mu, but this is still unproven. Yet how did this supposedly advanced civilization disappear? According to Kimura either rising sea levels eventually led to the abandonment of the city, or a earthquake displaced the island, letting the Yonaguni platform sink into the sea. Either of these scenarios are stark warnings for our modern and seemingly advanced civilization. We are just as vulnerable to earthquakes, and our own actions through our irresponsible use of Earth’s resources are contributing to the changing sea levels. 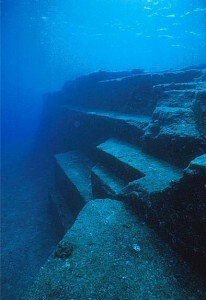 Regardless, Yonaguni stands as a testament to the power of nature. The Yonaguni monument is surrounded in mystery. It has been swept under the carpet of mainstream human history and in the process could wipe out a key period in Asia’s ancient history. Masaaki Kimura and people like Graham Hancock continue to show the world the unhidden mysteries that it still holds for us and lead the charge in rewriting our history on Earth.